A very special guest post by Thea Lojan. I believe in one God. Actually no… three. Three Gods. One really, but he’s like three, a buy-one-get-two-free kind of God. Yes, okay, he says he’s the one and only God back in the Old Testament, but that’s before he knew he was really three. This doesn’t make him/them anything like those collections of ancient Greek Gods, though, because he’s still only one God really. That’s what’s called the Trinity and I hope I’ve made it clear for you . Anyway, I believe in one God and in two others besides, creator, or creators, of Heaven and Earth. Yes, he/they definitely did this even though scientists think the universe was created billions of years before the Bible says it was and that God probably wasn’t even involved. But these scientists are all anti-Christian, that’s why they say that. If you have faith you know that of course God was involved. Other people who are also anti-Christian just out of spite say that if God made the Earth and all that is in it therein, then he must’ve made parasites and poisonous bugs and harmful bacteria and disease. But I’ve an answer to all that. Just don’t think about it. And I believe in Jesus Christ, his only son, our Lord. Yes definitely this, even though Jesus says he’s not really anything like God’s son in three of the eye-witness accounts of his life in God’s Word. I expect he was just a bit muddled when he said this, being away from home and down here instead of up in Heaven with his Heavenly Father. He probably meant to say he was God’s son because it’d be too weird if he really was God’s Son and didn’t know it. We should be grateful to those people who came after him who realised exactly who he was. And then there’s that bit somewhere about him being ‘begotten not made, of one substance with the father’, or something, which I think means he was more than God’s son. That he was, like, God himself. You’d think he’d remember that, wouldn’t you, when he was down here on Earth. What confuses me though is, if he was God, then who was he praying to all those times? I can’t get my head round that. But anyway, it’s a good job there were even more people who came after him who knew better than him and could tell he really was God. He was conceived by the Holy Spirit, born of the Virgin Mary. Well, you’ve got to believe this haven’t you, even though some people say ‘virgin’ should really just say ‘young woman’. A young woman might or might not be a virgin, especially if she wasn’t a Christian to begin with. It does make me wonder that if she was pregnant then it’s more than likely Mary wasn’t a virgin, ’cause we all know how babies get made. Still, if God’s Word says it was the ‘Holy Spirit’ that was the father then that’s what we should believe. If you want to know more about the Holy Spirit that can make people pregnant, well, we’ll get to it soon. He suffered under Pontius Pilate, was dead and was buried. He descended into hell and on the third day he rose again. I think a bit got missed out here – all the stuff Jesus said and did in between being born and suffering under Pontius Pilate. Isn’t that important? You bet it is. Pontius Pilate, by the way, was a Roman perculator who worked for Julius Caesar. I can’t find anything about Jesus ‘descending into hell’ in my Bible but I suppose it must be right. I definitely believe though that after three days and nights in the tomb he rose again from the dead. I mean, that’s a really important bit. I know he wasn’t in the tomb for a full three days and nights, even though he said he would be, but a day and a half is close enough. I guess that’s why we say ‘on the third day’ instead; it sounds like three days when it was only a day and half. But, you know, Friday night till Sunday morning – it’s legit to say ‘on the third day’. And we know he rose from the dead because Saint Paul said so – he saw him himself, in person. Well, not exactly in person but in his head. He was like an amazing flash of light in Paul’s head, a bit like an epileptic event, except, you know, like really real. And then other people started seeing him but not in their heads, as a real person, but one who could walk through walls and disappear if he felt like it. Totally real. Amazing. I’ll be back next time to tell you what else Christians believe. In the meantime, keep praising the Lord! Thea was talking about the Apostles’ Creed, though she also mentions the Nicene Creed. The Apostles’ Creed was created prior to 390CE and the Nicene Creed in 325, both quite a bit after Jesus’ lifetime. Three hundred years after, in fact. 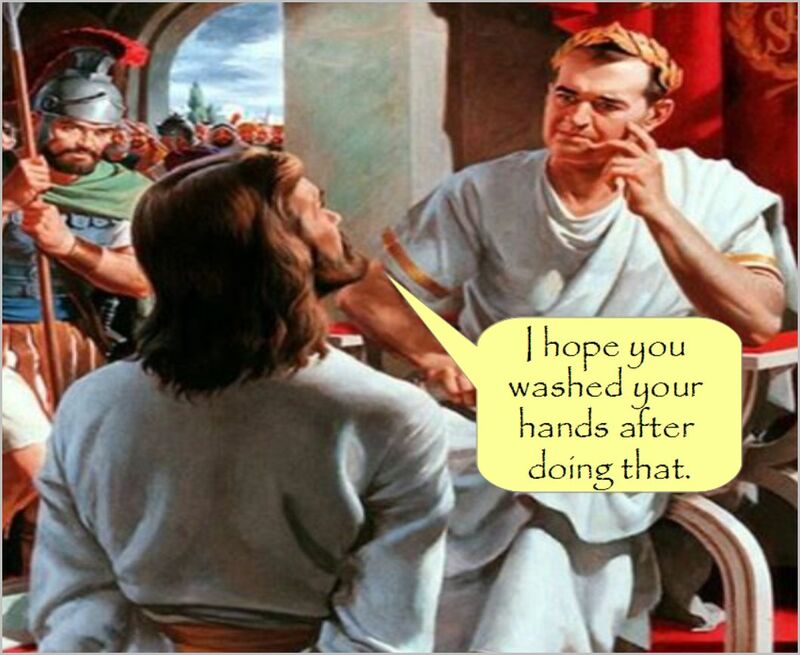 Oh, and Pontius Pilate was a Roman procurator or prefect during the reign of the Emperor Tiberius. This entry was posted in Bible contradictions, Christian failure, Christianity's failure to deliver, The Bible's unreliability, The impossibility of faith and tagged Bible, Christianity, Christians, failed prophecies, God, Gospel, Holy Spirit, Jesus, Paul, Pontius Pilate, Resurrection, the Apostles' Creed, the Trinity by Neil. Bookmark the permalink.